Deposed Ivorian President Laurent Gbagbo is pictured in Korhogo, Ivory Coast, on May 2. Abidjan, Ivory Coast (CNN) -- A video that has gone viral in Ivory Coast has raised questions about the treatment of the government of former President Laurent Gbagbo, who lost last November's election, but did not leave power until he was arrested in April. The out-of-focus, grainy 5-minute video shows armed men in uniform in what appears to be a military camp speaking sternly to a group of at least seven other men, ordering them to do pushups and to maintain stress positions. The targets of the haranguing in the video appear to be high-ranking members of Gbagbo's former government -- including his son Michel Gbagbo and Pascal Affi N'guessan, the president of Laurent Gbagbo's political party, the Ivorian Popular Front (FPI). But CNN could not independently verify its authenticity or determine when, where or by whom the video was shot. One of the uniformed men accuses the men in the other group of having stolen money and of having refused to accept the victory of the current president, Alassane Ouattara. During the three-month interregnum between the time of the election and the time Ouattara finally took power, some 3,000 people were killed. Prosecutor Simplice Kouadio told CNN he could not comment on the detention of the people in the video since they had not been charged. "It is up to the Ministry of Homeland Security to deal with this issue," he said. "We will be involved when they are formerly charged." Nina Toure, a spokeswoman for the Ministry of Homeland Security, told CNN that the video represented an isolated incident and that "the detainees are not ill-treated." In a phone interview from Paris, a lawyer for the former president said the video confirms what Gbagbo's legal defense has denounced as a "mockery of justice." 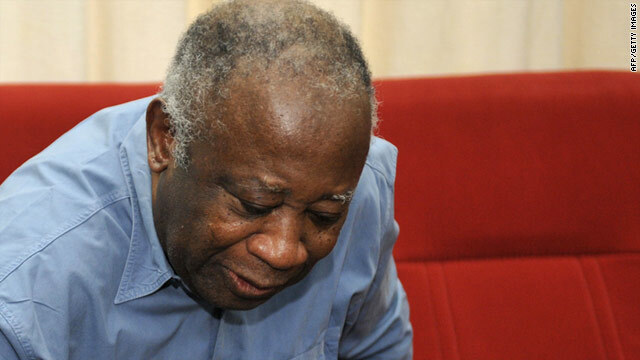 "Dozens of people close to Laurent Gbagbo, including the former president and his wife, are being illegally detained and abused in complicity with the U.N.," said the lawyer, Habiba Tourea. The United Nations has said its representatives have been doing their best to ensure that all detainees were well treated. In a recent report, Amnesty International expressed concern that a number of individuals held at the Pegola Hotel here by Ouattara's government may be prisoners of conscience, held solely because of their political opinions, real or perceived. "The organization is particularly worried about the plight of 23 members of the police and military held in the northern town of Korhogo in conditions that may be life-threatening," Amnesty said. "Detaining people without charge is in direct breach of international human rights standards. The authorities in Cote d'Ivoire must promptly charge all detainees with a recognizable criminal offense, or else release them immediately." An Amnesty delegation recently visited detainees at the hotel, but said they were denied access to those being held in Korhogo and two other northern towns, Bouna and Odienne. A number of those detained at the hotel were beaten at the time of their arrest by Republican Force of Ivory Coast forces loyal to Ouattara, Amnesty said in a news release issued on June 22. Following that report, the Ministry of Justice announced last week that 21 of the detainees -- most of whom were being held in the hotel -- had been charged with various crimes, including aggravated theft, misappropriation of public funds, looting, attack against the authority of the state constitution, rebellion, tribalism, xenophobia and threatening national security. The ministry also issued an international warrant for some Gbagbo supporters who have gone into exile, including Charles Ble Goude, a leader of Gbagbo supporters who has called for attacks on U.N. soldiers.